This Irish themed slot from Playtech might look like a load of its contemporaries on the surface but thanks to innovative gameplay touches, its easily able to hold its own against the competition. With its creative approach to pay line structures, and its huge potential progressive jackpot win, this machine is anything but “yet any other case of leprechauns and pots of gold”. Great approach to win lines. There are a massive 576 ways to win. This is because all adjacent matching symbols will pay irrespective of position on the reels. Lots of bonus features. Who doesn’t love a slot machine with loads of fun ways to win? Progressive jackpot. 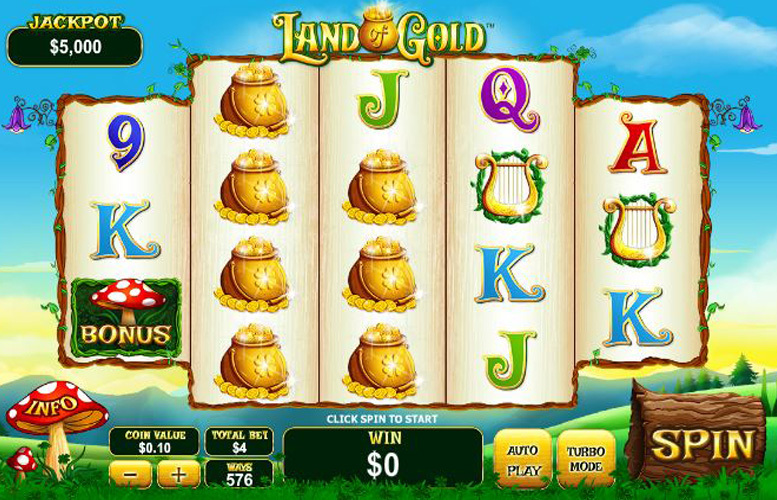 There is a chance to win some truly huge cash in Land of Gold. More on that later however. Thematically uninspired. There are loads of similar looking, slot machines and even though this one is certainly better than the average Irish themed machine out there, a quick glance might cause many to overlook it. The differing sized reels might be off-putting for some. The actual structure of the board looks quite alien when compared to many other slots, and this might cause confusion. Pot of gold = 1,500x the line bet. Rainbow = 750x the line bet. Four leafed clover = 500x the line bet. Golden horseshoe = 250x the line bet. As mentioned Land of Gold uses an innovative take on traditional win lines. There are a massive 576 different ways to win. Any adjacent symbols from left to right will pay a win according to the pay table. The figure we’ve quoted here is multiplied by coin value set by the player. 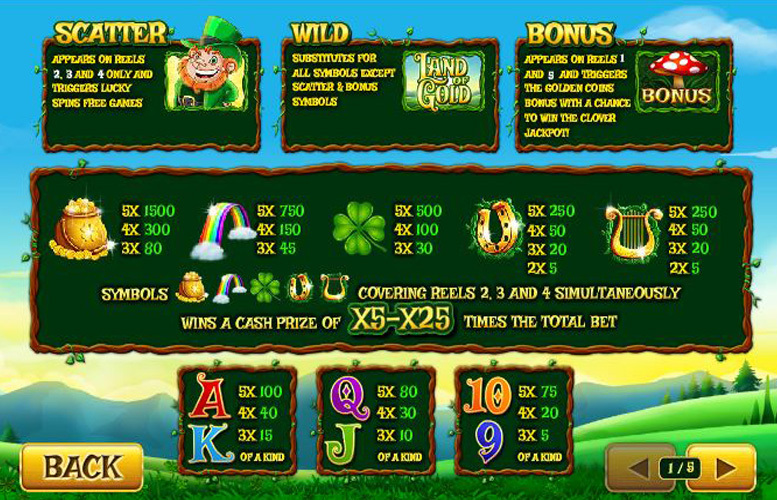 Landing three leprechaun “scatter” symbols on reels 2, 3, and 4 simultaneously will trigger the Lucky Spins Free Games feature. 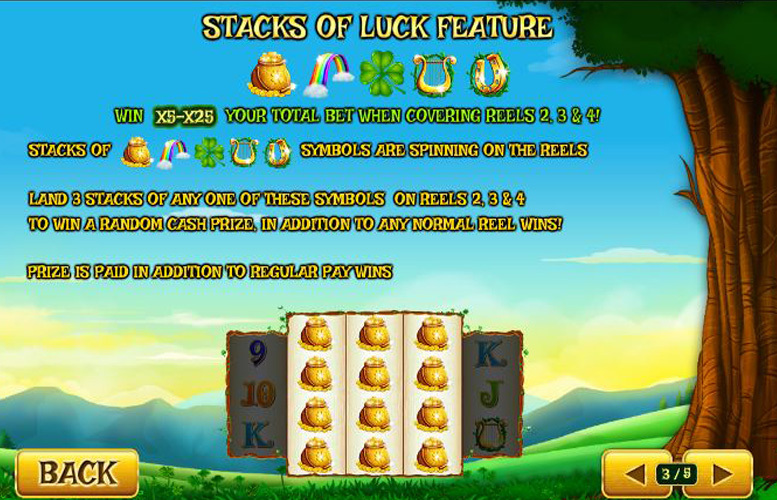 Players must spin the wheel of luck to receive multipliers, and additional spins. When they hit the collect section of the wheel, they receive the relevant number of bonus spins, with any wins multiplied by the factor won. In addition, if they’re fortunate enough to hit three more scatter symbols, they’ll receive an extra five spins. What’s more, this dynamic can continue indefinitely. This one is straightforward. It’s difficult to imagine ever hitting a stack of luck and payment probably doesn’t justify how unlikely it is to happen. Basically, players must land three stacks of any high value symbol on the central reels, and they’ll be paid between five and twenty-five times the coin value, in addition to any wins awarded. If players land the Bonus Mushroom on reels 1, and 5 together, they’ll trigger the Golden Coins Bonus. Players must use the mushroom to make the leprechaun jump up to grab gold coins. These award cash prizes. There’s also a big gold coin that’s worth a much bigger prize. The game continues until you hit a crow. If you’re incredibly lucky, you’ll also manage to collect three four leaf clovers during this mode. You’ll receive the entire progressive jackpot if you do. With its somewhat unique pay line format, Land of Gold’s betting limits are interesting too. 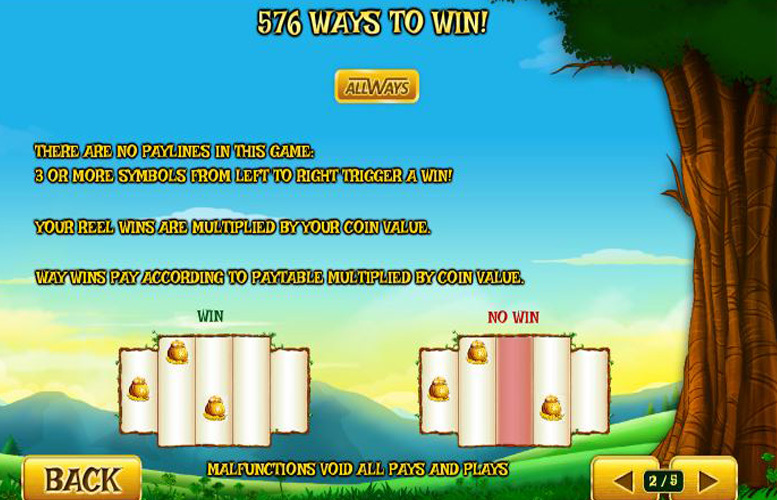 There are 576 ways to win, which somehow equates to forty lines (in terms of payment). Players bet one coin per line, and decide the value of this coin themselves. They can choose one of several increments between 1p and £2 bet per line. This makes the highest possible spin £80, and the lowest just 40p. Despite its somewhat tired theme, Land of Gold is a great machine. It’s the kind of game that I’d usually not bother with through becoming bored of Irish themed slots generally but thanks to its host of great features it provides an entertaining and potentially lucrative gambling experience. This game has a rating of 4 / 5 with 302 total reviews by the users.